The Organization of Women Leaders is proud to support the 11th annual Wahine Forum on Thursday, October 25 at the Hilton Hawaiian Village Coral Ballrooms, 7:30 a.m.-4:30 p.m.
Join us and nearly 900 attendees at Hawaii’s largest leadership and career development conference for women. This year the theme is We Are Wahine. Connect with like-minded wahine and cultivate relationships at this a full day forum featuring national speakers. Please mark your calendars and visit wahine.hawaiibusiness.com to register for the conference. Outrigger Canoe Club - 2909 Kalakaua Ave. It's time for our annual get together. Members and guests are welcome to come and enjoy an evening with your OWL sisters, meet new friends, and a chance to win fabulous door prizes. Don't miss this year's workshop speaker, Pene Paik, who will provide valuable information to our OWL ladies on "The Art of Public Speaking." If you and/or your company are interested in sponsoring our OWL annual Pau Hana, please email Board President Val Schmidt at: valerie.x.schmidt@ampf.com. OWL again supported the YWCA's annual Women’s Legislative Caucus Breakfast on Wednesday, January 24th at the YWCA’s Fuller Hall. The caucus, in existence for over two decades, includes all members of the Hawaii Legislature — currently 15 in the House and seven in the Senate. It is a formal, bipartisan, and bicameral caucus that each year introduces an official package of bills and resolutions in both the Senate and House of Representatives. The Caucus' legislative agenda focuses on women, children and families. This year's sold-out breakfast and press conference was organized to provide supporters with a preview of the 15 bills that will be proposed in the upcoming session. This year's initiatives cover a broad spectrum of issues from ensuring access to quality healthcare, reducing violence against women, increasing economic opportunities for women in our state, protecting children, and ensuring equal opportunity for women. Thank you to OWL members Lisa Ma, Renee Green, Pam Harms and Julie Arigo for their assistance at the registration table during the Women's Legislative Caucus Breakfast! 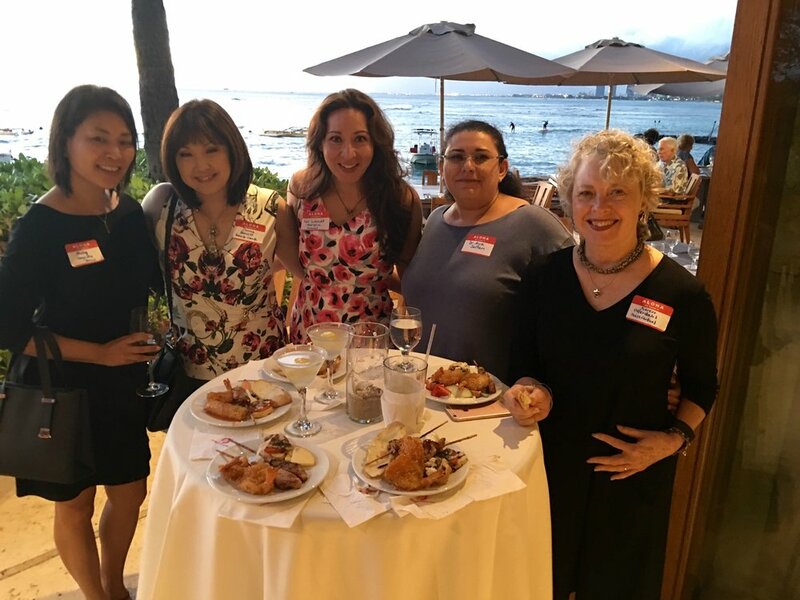 The 10th annual Hawaii Business Wahine Forum was held on October 26th. OWL once again supported this important event for women in Hawaii. Thank you to all the OWL ladies who helped man our booth and promote our great organization! This year's forum centered on the theme “Work Together, Rise Together." Build your Life, Shape our World”. The theme was meant to encourage today’s women leaders to become mentors and sponsors for the next generation. The conference featured about 35 local and national speakers in 10 sessions that focused on leadership, negotiating, building confidence and, especially, effective collaborations. It's time for our annual get together. Members and guests are welcome to come and enjoy an evening with your OWL sisters, meet new friends, and a chance to win fabulous door prizes! OWL Member's are invited to join the Women's Fund of Hawaii on May 15th for their Annual Tea and Champagne Fund Raiser! "When women thrive, communities prosper." The OWL Board invites all OWL members and their guests to join us for our OWL Spring Mixer. We also would like to give a big THANK YOU to our sponsor for this event: Kaiser Permanente, Hawaii. Cost: $25 if paid by April 13th and $35 thereafter. Heavy pupus, no-host cocktails. Please make your check payable to OWL Hawaii and mail to OWL (516 Kawaihae St #E Honolulu, HI 96825). The Spring Mixer will feature our popular OWL DOOR PRIZE DRAWING! Door prize donations are welcome! Please contact board member Tracie Young at tmidori22@gmail.com. In addition to fun and camaraderie, Barbra Pleadwell, communications strategist and cofounder of Hastings & Pleadwell will conduct a 30-minute educational seminar "Hoot Your Own" sharing tips on creating a professional bio and taking a quality business photo. Barbra is a past president of OWL and recent past board chair of the YWCA Oahu. She helped launch the largest women’s volunteer organization HerStory conference and worked with Hawaii Business Magazine to create and build Wahine Forum, Hawaii’s leading women’s business conference. "Hoot Your Own Horn" Workshop 5:30 - 6:00 p.m.
Mixer 6:00 - 7:30 p.m.
OWL again supported the YWCA's annual Women’s Legislative Caucus Breakfast on Thursday, January 26th at the YWCA’s Fuller Hall. The Hawaii Women's Legislative Caucus is a formal, bipartisan, and bicameral caucus that each year introduces an official package of bills and resolutions in both the Senate and House of Representatives. The Caucus' legislative agenda focuses on women, children and families. All women legislators are members. This year's caucus package is dedicated to the Women's March on Washington. This well-attended breakfast event was organized to provide supporters with a preview of the bills that will be proposed in the upcoming session. These bills include access to quality healthcare, reducing violence against women, economic opportunities for women, and children's health and safety. This event offers a unique opportunity to hear from our women legislators and all those in attendance were inspired by their dedication to Hawaii's women, children and families. The OWL Board of Directors would like to thank all of those who attended the OWL annual Pau Hana event at the Outrigger Canoe Club on September 28, 2016 from 5:30-7:30pm. It is always so great to see our OWL sisters and guests having a fantastic time catching up and networking. A highlight of the evening again this year was the prize give-aways -- thank you to all who donated items for this wonderful event. The Pau Hana is a great way for OWL members and guests to get to know each other, offering an informal evening at a truly beautiful venue on the shores of Waikiki. The OWL ladies were very excited about our last meeting of the year - if you have not done so yet, invite some friends in the community who would appreciate coming to our luncheon. Hope to see you next year at our annual Pau Hana!